Let this list serve as chicken scratch, essentially. 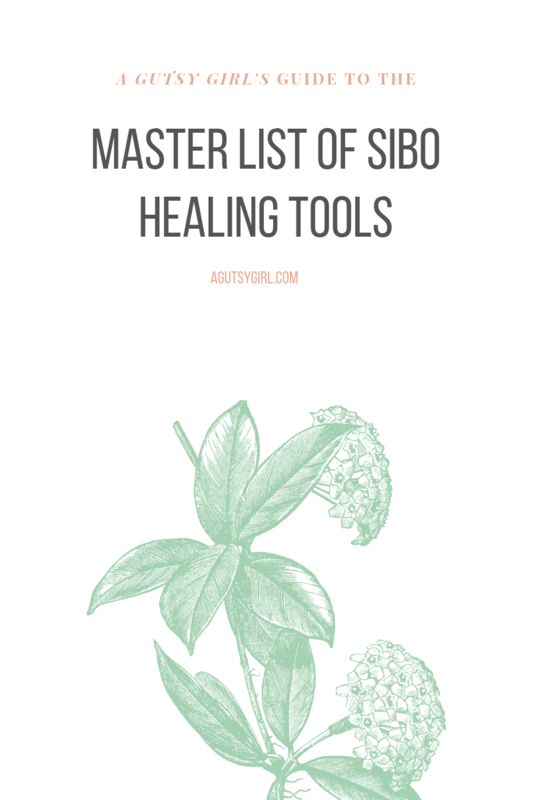 I wanted a place to brain dump for you guys all the different things I have done over the years to heal my SIBO for good. Why do I refer to these as tools? Because that’s what they are. Handymen carry around a tool box filled with different and multiple tools because when they arrive to a job, they never know exactly which tool they might need. In addition, sometimes there is more than just one tool that could be right for the job. The same goes for your SIBO healing journey. Am I saying that this is an exhaustive tool list? No; I don’t think there will ever be an exhaustive tool list. I returned to all notes since I was first diagnosed, pulling out every last thing I did and tried. While it’s not an exhaustive list, it’s a huge list with plenty of ideas/options/tools. There are a few I added to the list that I have not tried. I added them in because I know they are popular, but made note if I’ve never tried it. For any of the below, if I have not written an entire post on it, but you want to know more about that particular item, let me know in the comments below (or contact me HERE). First time, 2015. Rifaximin only for 21 days. Second time, early 2016. Rifaximin for 21 days and Neomycin for 14 days. Third time, May/June 2016. Rifaximin for 28 days and no Neomycin (instead we coupled with the Siebecker protocol: Allimax Pro, Neem Synergy, and Berberine Complex. Fourth time, March of 2017. Levels were so low, though, so I only did Atrantil for a month. Fifth and final time, 2018. Rifaximin for 28 days and Neomycin for 14 days. I documented the entire 28-days HERE. Low-dose Erythromycin – I have not used this. Prucalopride – I have not used this. Elemental Diet – I have not done this. Bi-Phasic Diet – I have not done this. Two stewed apples daily. Here is exactly what my doctor said, “Please eat the equivalent of two stewed apples every day. This can have amazing benefits on gastrointestinal function, inflammation, liver and gallbladder function, etc. To be simple, you can make this with just apples and cinnamon if you want to avoid any extra sugar. Also, I don’t worry about peeling the apples.” The recipe can be found HERE. I have yet to try this one. Other general herbs and/or essential oils – I’ve tried many, but nowhere near all. 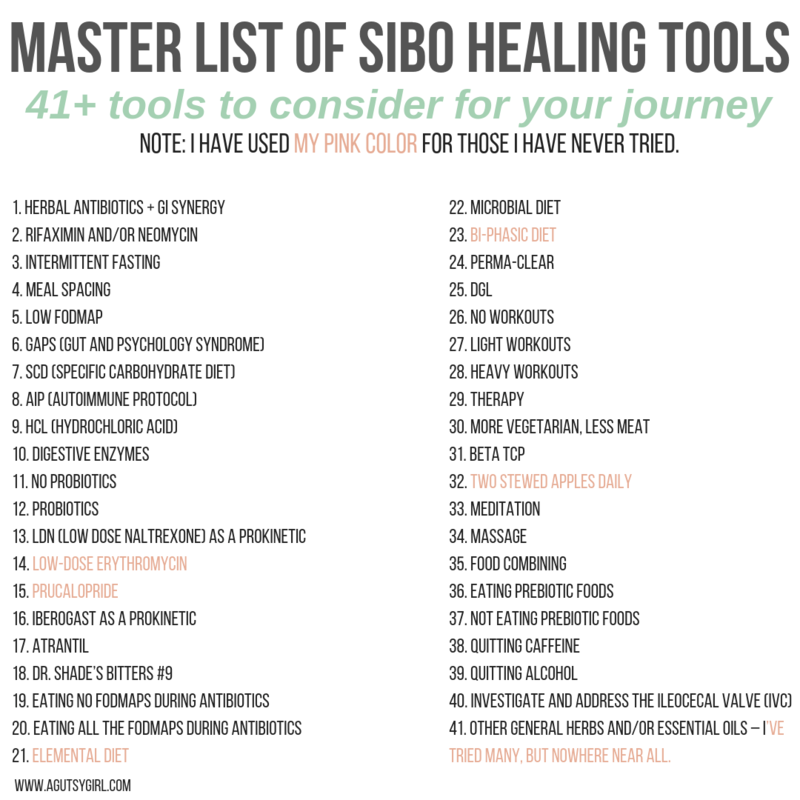 Which SIBO Tools Work Best? Whew! There you have it. Pretty unreal, right? But wait. You provided all these tools, so what combination worked best for you? What are your top recommendations of all the things you’ve ever tried? I keep no secrets because my goal with A Gutsy Girl is to form community where we can share with each other and I can help YOU heal. I want nothing more than to see you thrive so that there’s one less person living in gut h@#$. I’ll share it with you tomorrow, and if you’re worried about missing it, simply sign up for my exclusive newsletter and I’ll send it directly to you as soon as it’s published!